Rainbow Riches Drops of Gold by Barcrest. It's an Irish luck-themed slot with 5 reels and 50 to 200 paylines. The game includes features like Free Spins, Drops of Gold Bonus feature where will symbols drop onto the reels, a Big Bet feature which gives you access to larger wins for a higher stake, low-value symbol swaps and more. The slot can be played on mobile, desktop and tablet for stakes starting from 10p to £500 per spin. unless bingo sites are more your wavelength, in that case you're in luck! Barcrest is one of the most respected online software developers in the industry. 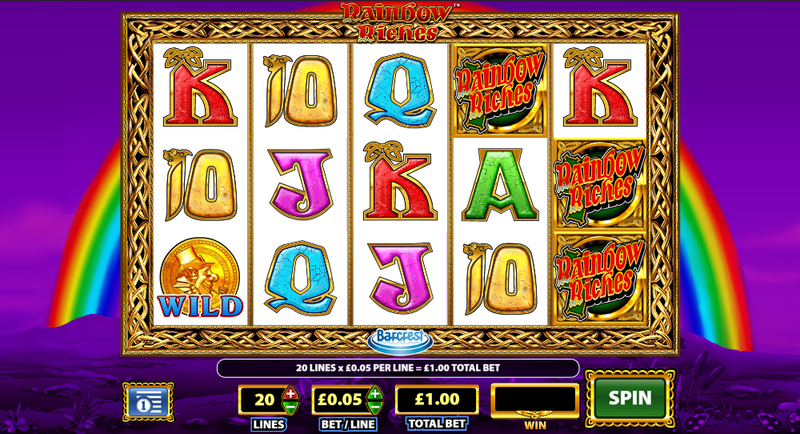 At one point in time, all the slots in the UK were registered by Barcrest. Their mark was everywhere you'd go- pubs, bars, airports, etc. They still have a wide audience to date who enjoy their games. Rainbow Riches Drops of Gold is yet another addition to the Barcrest Rainbow slot series available on Barbadosbingo.com. It looks just like other Rainbow Riches slots. Symbols on the reels include; A, K, Q, J and 10 playing card values, lucky horseshoes, violins, harps, mushrooms and the Rainbow Riches symbol which pays the highest value of 5x your bet for 5 on a line. Wild symbol -There are 2 wilds- the silver and gold pot wilds. Silver wilds replace all symbols except the Bonus symbol while gold pots replace all symbols. Drops of Gold Bonus feature -There will be a rainbow of silver and gold pots over the lower/main reel set that's 5 reels wide and 4 symbols high. If the 5th reel has a Drops of Gold or double the height Drops of Gold icon after a spin, all pots that are within the drop zone fall onto the corresponding position on the lower or main reel set. If a double-height Drops of Gold symbol lands as a whole or halved, it activates the feature. Silver pot wild symbols that drop onto any Bonus symbol will transform into gold pots which replace the Bonus symbol. Free Spins Bonus feature -The free spins feature is played when players land 3 or more pots of gold Bonus icons anywhere on the reels. 3, 4 or 5 gold bonus symbols reward players 8, 12 or 16 free spins. Keep an eye out for the Bonus icon during the feature because 3 or more will reactivate the feature. You can end up winning up to 32 free spins in total. What’s even better is that you can activate the Drops of Gold Bonus feature and benefit from plenty of extra wilds if the Drops of Gold or double-height Drops of Gold symbol lands on the 5th reel. Big Bet feature -This feature gives you the option to choose from £20, £30 or a £50 stake option which comes with plenty of extras. To begin with, the RTP % rises thus improving your winning chances. For the £20 option, the rainbow above the reel set transforms into a Super Rainbow which has more silver and gold pot wilds. Only the double-height Drops of Gold icon hits the 5th reel improving your chances of activating the Drops of Gold feature. For the £30 game, spinners get the same bonuses as the £20 option. However, all low-value symbols are removed from the reels. For the £50 option, all the above applies but spinners get to play on a reel set with 100 paylines. If you trigger the Free Spins Bonus feature during this game option, you will play on a reel set with 200 paylines. 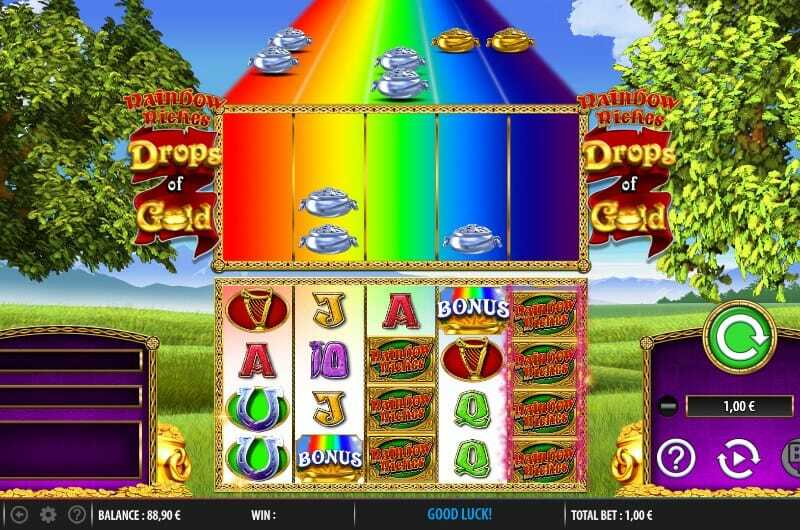 Rainbow Riches Drops of Gold is a medium variance game. You can win up to 500x your bet on each spin. If you love the slots part of the Rainbow series already, you’re going to love this one too so read more about our other games too.